Think skiing, snowmobiling and sledding provide the only outdoor fun this winter? How about trying something new? Here are five unique ways to get outside and enjoy Michigan’s cold weather. Elk may be one of Michigan’s best-kept secrets. Michigan’s wild elk herd live less than four hours north of Detroit, in the 105,000-acre Pigeon River Country State Forest near Gaylord. Thanks to extensive public and private wildlife management in the last four decades, wildlife experts estimate that more than 1,000 elk live in and around this enormous state forest. 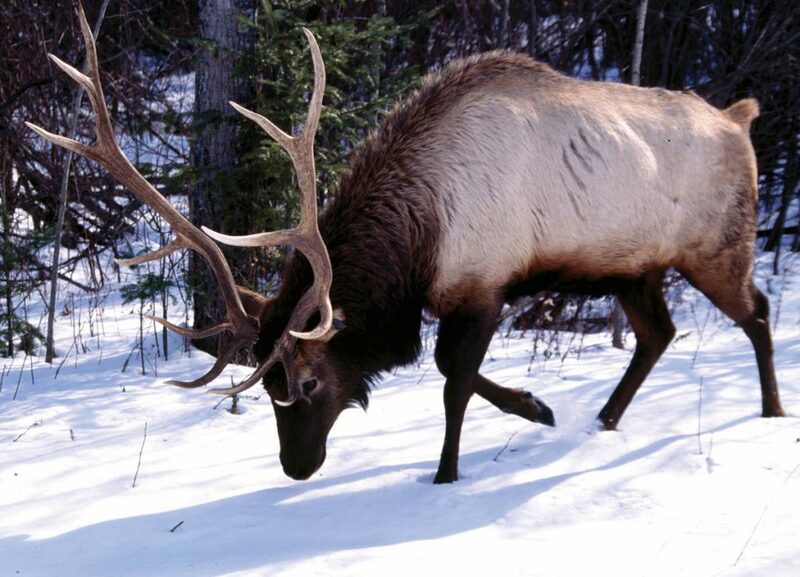 But finding the elk can be a challenge – especially for city slickers. Thunder Bay Resort, located near the tip of the Lower Peninsula in Hillman, hosts excursions that will take you over the river and through the woods on an elk-viewing adventure. Pulled by massive teams of Belgian draft horses, sleighs will deliver you to a heavily wooded, private elk preserve where you’ll have plenty of time to snap pictures of the majestic animals. “We’ve got some nice, wool blankets so folks stay nice and toasty on the sleigh. It’s a great experience,” said Jack Matthias, owner. After getting a peek at the elk, guests move on to a large log cabin in the woods to enjoy a five-course gourmet dinner prepared before them on a 125-year-old cookstove. The evening also includes a sampling of local wines. Guests have the option of staying the night in one of the resort’s suites, villas, chalets or log homes. The folks at the Muskegon Winter Sports Complex really love frigid temperatures. The facility, located within Muskegon State Park, offers a wide range of cold-weather recreation, from cross-country skiing and sledding to snowshoeing and skating. 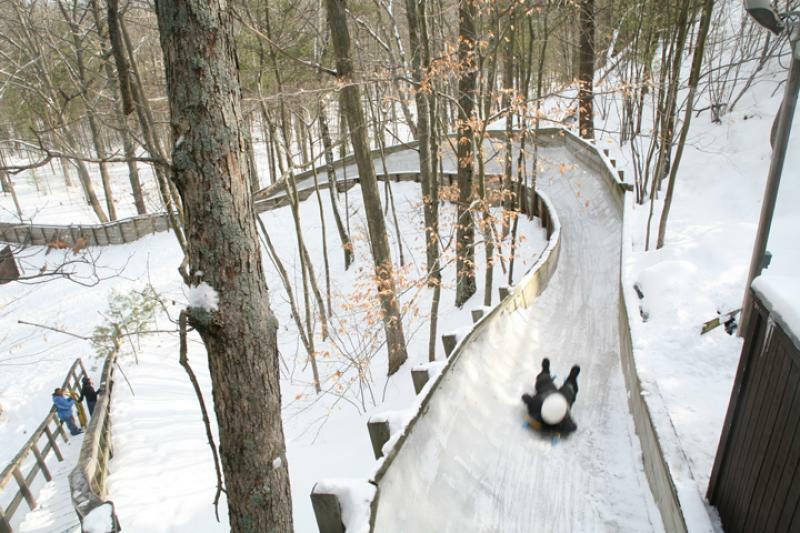 But one of the most coveted tickets in town is for the luge – one of only four such tracks in the U.S.. The Olympian-designed track consists of six curves and two starting areas. It was built specifically for the general public and newcomers to the sport. Participants are outfitted with elbow pads and a helmet before they climb aboard an authentic luge training sled handcrafted by Austrian builders. Public luge sessions are scheduled Friday to Sunday each winter weekend. Sessions fill up quickly, so reservations are encouraged. Tickets are $49 for a 150-minute session. BAD Brewing boasts three beer garden igloos, two requiring a minimum of eight guests and a reservation fee of $35 Sunday through Thursday, or $75 Friday and Saturday. Photo Credit: BAD Brewing Co. Looking for a cool place to hang with friends this winter? Then check out one of the patio igloos popping up outside restaurants, bars and coffee shops across Michigan and the Midwest. The hottest tables in town this winter are quite often outdoors beneath one of these snow-covered geometric bubbles. 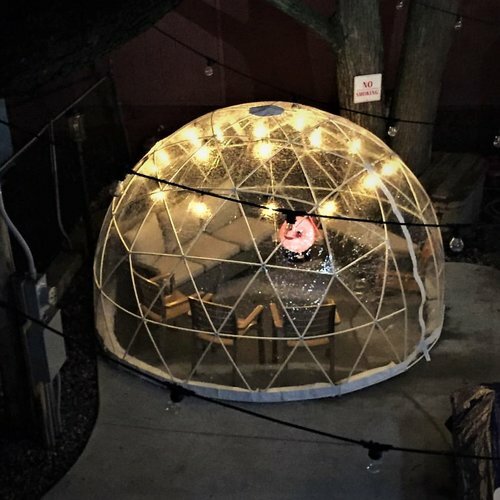 Bundled-up restaurant and bar patrons from Marquette to Detroit – and many cities in between – are clamoring for a seat beneath the clear plastic domes. “We’re pretty well booked through February,” said Nicole Walker of BAD Brewing Co. in downtown Mason. The igloo craze is so big that reservations and rental fees are required at many pubs and restaurants featuring the ice domes. BAD Brewing boasts three beer garden igloos, two requiring a minimum of eight guests and a reservation fee of $35 Sunday through Thursday, or $75 Friday and Saturday. The brewery unveiled its domes in December. “Bring your Bluetooth speaker, drink a couple of beers and spend some time with your friends. Sounds like a great way to spend a winter evening to me,” Walker said. Free Fishing Weekend will take place at state parks and recreation areas across the state on Feb. 16 and 17. Photo Credit: Michigan Department of Natural Resources. 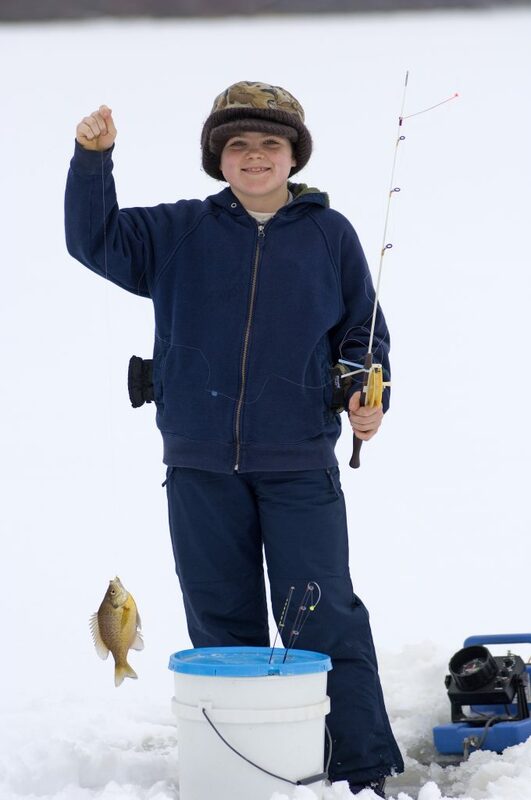 Families and friends can enjoy one of Michigan’s premier outdoor activities – fishing – for free Feb. 16-17. During Free Fishing Weekend, residents and out-of-state visitors may enjoy fishing on inland and Great Lakes waters for all species of fish without purchasing a fishing license. All fishing regulations still apply. Additionally, that same weekend, the DNR will waive the regular Recreation Passport entry fee that grants vehicle access to state parks. The Michigan Department of Natural Resources is planning special events across the state Feb. 16-17. Seven Lakes State Park in Holly, for instance, will host a free ice fishing derby from 10 a.m. to 2 p.m. Feb. 16 in honor of the 100th anniversary of Michigan state parks. Prizes will be awarded for the biggest fish taken. Bait and loaner gear will be provided at Seven Lakes on a first-come, first-served basis. Volunteers will be on hand to help newcomers. “We hope to get a lot of people who have never tried ice fishing before. Our goal is to help people find something they like to do in the winter. Because even if it’s cold outside, there’s still a lot of fun out there,” said Andrew Cole, park supervisor. Along with the Great Lakes, Michigan boasts tens of thousands of miles of streams and more than 11,000 inland lakes. Through the management of natural resources – including the carefully regulated taking of fish – Michigan ensures the health of these waterways. The Michigan Wildlife Council is dedicated to increasing public understanding of the important role wildlife management plays in the conservation of the state’s natural resources. That work includes sharing information about regulations that ensure wildlife populations are sustainable and non-endangered – and remain in balance with their habitats and other species. The majority of Michigan’s conservation efforts are funded through the purchase of hunting and fishing licenses – not tax dollars. “So, even you don’t hunt or fish, all Michiganders benefit from wildlife conservation and management. This work ensures Michigan’s wildlife and natural resources will be here for generations to come,” said Matt Pedigo, chairman of the Michigan Wildlife Council. Seasoned ice climbers and newcomers alike are flocking to Fenton to scale two ice towers at Peabody Ice Climbing. 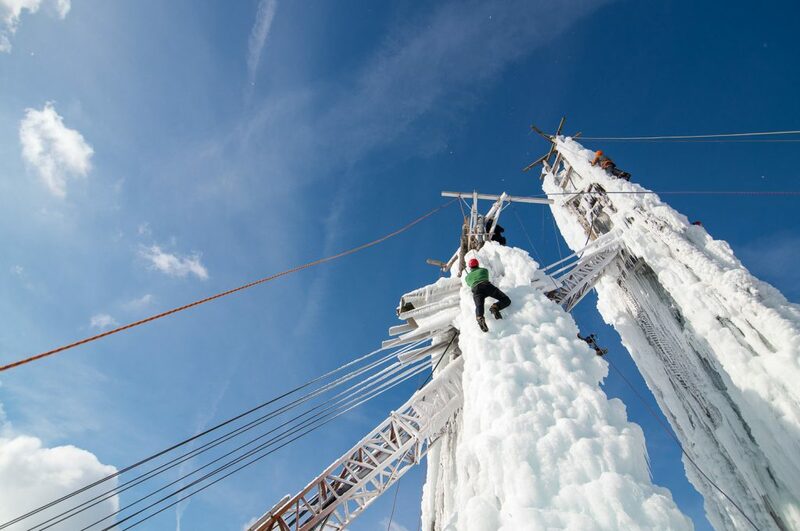 Located on a retired apple orchard, the 45- and 72-foot-tall towers are iced over in winter for experienced climbers who need to train and for folks who’d like to take a stab at the sport. “If you can climb a ladder, you can climb ice. It’s just a matter of learning to do it safely,” said Garrett Peabody, owner and certified trainer. Ann Arbor’s Meghan Sullivan, an avid outdoorswoman and rock climber, said ice climbing was a natural progression for her. “Living in Michigan, half of the year is winter. So, I’m willing to try any outdoor winter sport at least once. I just fell in love with ice climbing,” said Sullivan, a web developer and designer. Peabody Ice Climbing attracts visitors from across Michigan and the Midwest. Day passes are $20; gear rental and instruction are additional fees. “When the weather is cold enough, we get about 120 climbers who come through here on a weekend. It’s awesome,” Peabody said.